Eyes, ears, and more eyes! Started off by plotting out the eyes a little more. 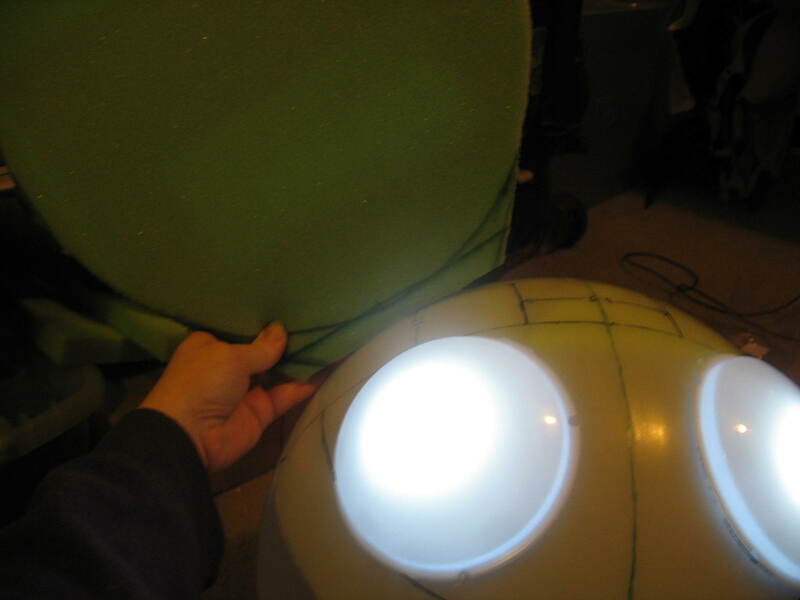 The client decided he liked the LED of the smaller lights, but liked the size of the bigger eyes more. So I made a double-pattern. 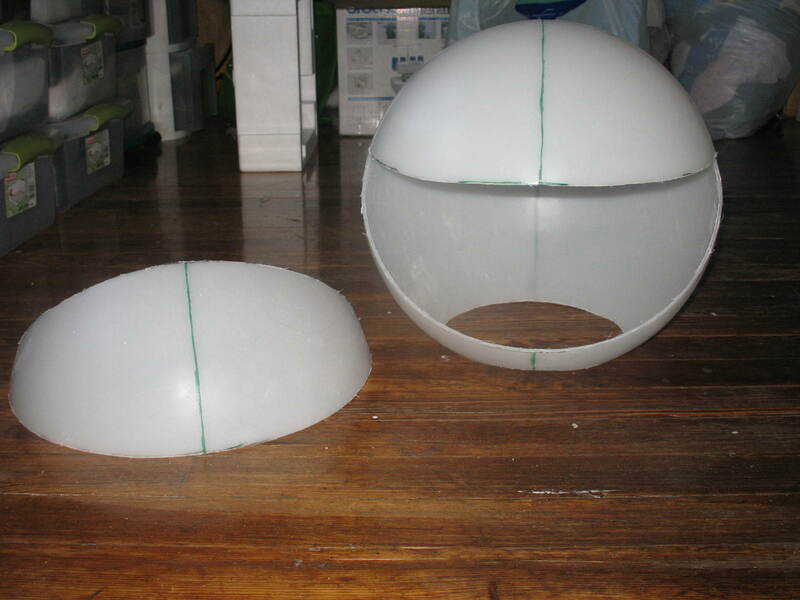 One was the cut out for the size of the smaller lights with the domes removed, and one was where the bigger eyes would sit. You can see how the bigger eyes will look. They're just taped on here for reference for my client. 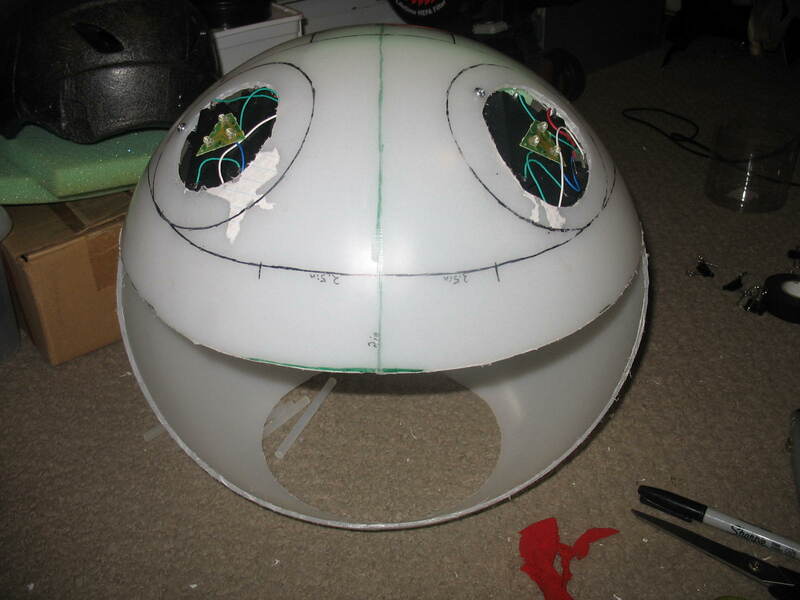 I cut out the inner eyes, practically disembowled the LED lights, and set them in by reversing the screws. 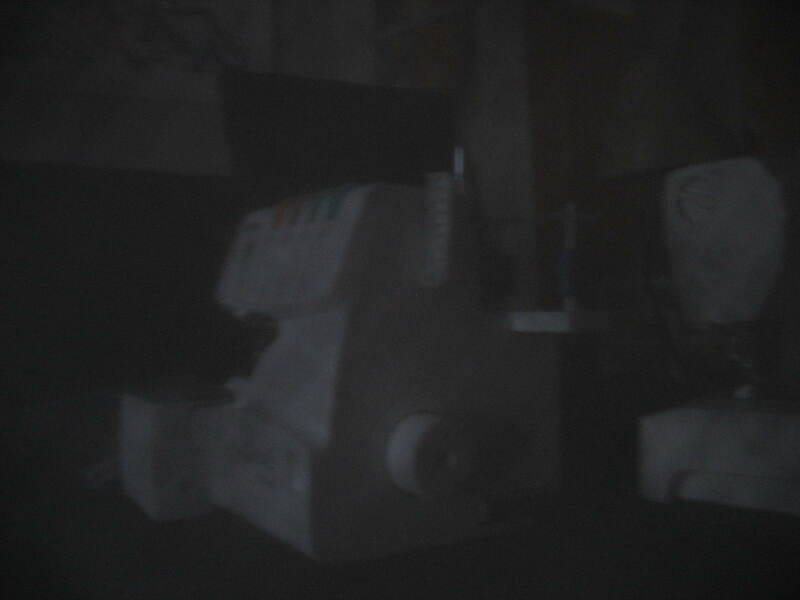 I will do more screws when everything's set to go on permenantly - I discovered the toggle switch can be moved, so I moved it to a better location for the client to click the lights on, but unfortunately I need to figure out a better way to set the switch so the eyes won't break at some point. That's in the works. 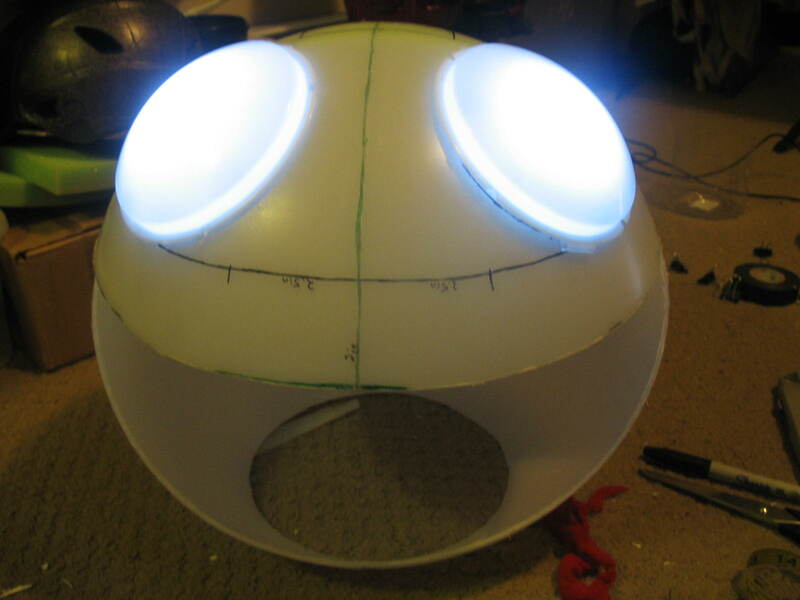 How the eyes look with the LEDs on and the bigger lights over them. 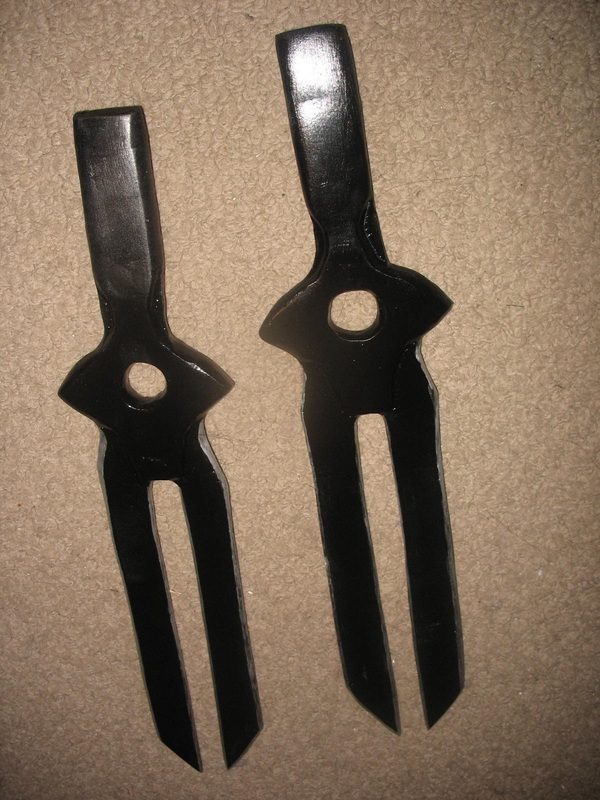 They are VERY bright and easily light up the whole room with the lights dimmed or off. This is the cardboard backed ear - but I'm not particularly happy with the cardboard, so I am going to try a different method involving very long screws. I'll be picking those up today from Lowes. Once I have the holes set for the ears, I need to get the 1/4 inch thick lip on the inside of the head, then start attaching all the fabric! After the fabric, it will be the mesh that covers the mouth, finalize the position of the helmet inside, and this project will be ready to ship off to the client! I started cutting out the ears, leaving some space at the bottom to get it into the head. You can see the basic circle I worked with in the middle and the rough cut out first ear. 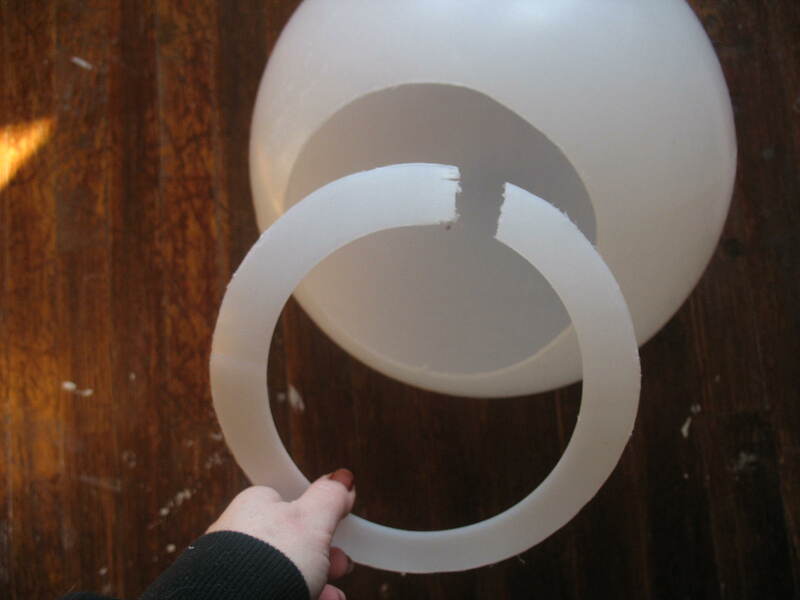 The ears are 13 inches x 13 inches in a circle. Here's the one ear softened out. Funny enough, sand paper worked nicely to smooth out the rough edges even in foam. I'll be putting cardboard behind the ears I decided to make sure they hold their shape all the time instead of trying to work a wire or something into the foam. Just a little reference shot, but wow is that hard to do without another set of hands! You can sort of see how big the ears are compared to the head. Oh good, I look like an idiot. I have a balaclava on because my hair kept annoying me as I was trying to get the head on and off. You can see the helmet's temporary installation. There's two inches of foam above it supporting the helmet and putting it in proper place. It gives me enough room to get the lights in where they have to sit, and puts the face in a nice place in the space of the mouth. 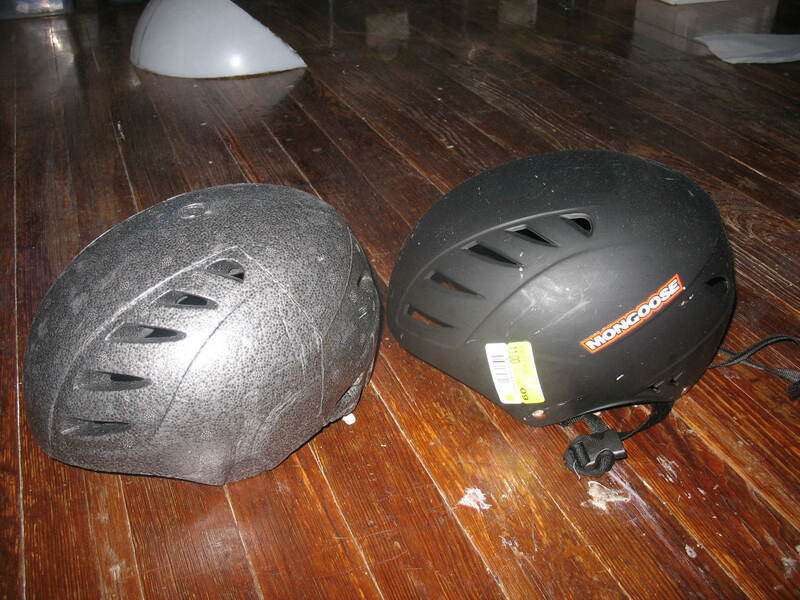 The helmet's a nice comfortable fit and keeps the head off the shoulders for added wearer comfort. After some doodling on the head itself - sharpies are the only thing that works on it, but actually can be erased with some serious rubbing. Dry erase markers don't stay very well but are good for temporary marking. 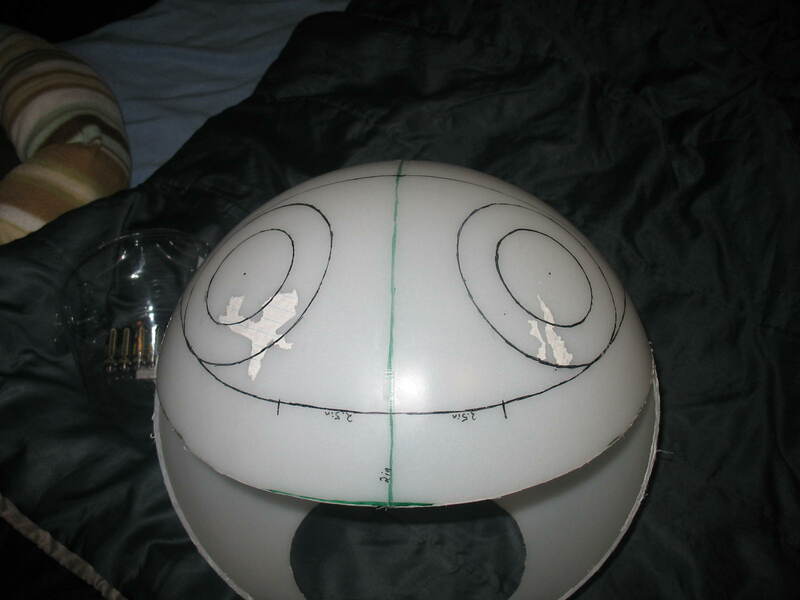 The eyes are five inches apart, and I used the dome lights from the tap light I'll be using to make those little paper circles. Some temporary adhesive to attach the eyes and make sure it looked good. That's where the cuts will be. The lights will tap by pressing them on from the underside before putting the head on I think. 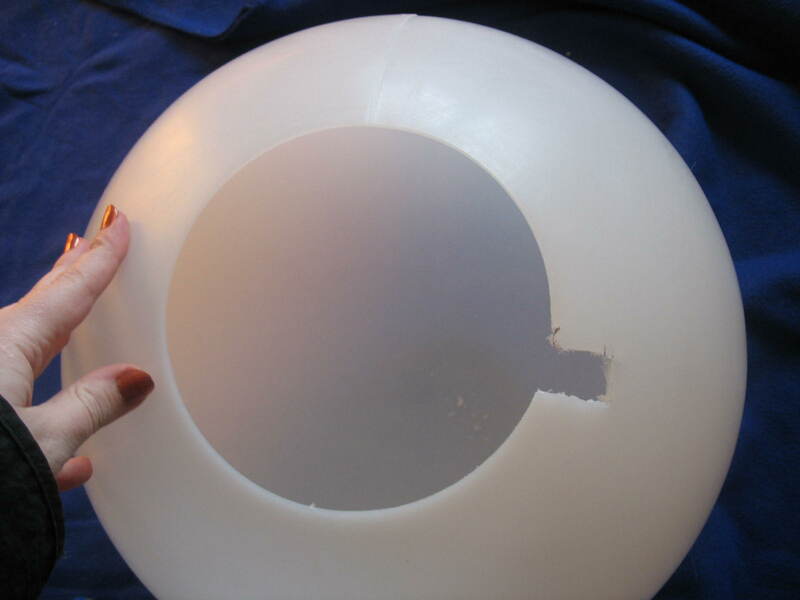 You can see the dome put on (using some of the stickiness of the temporary adhesive to hold it there long enough to snap the picture) at the site of the paper circle. That's exactly what it'll look like sticking out from black cloth I'll be using to cover this. That's all for now! Eye cutting will be next I think. This, basically, is what I'm making. Every time I look at it, I have to giggle. What an odd prop to be creating! This, my friends, is the head-piece that Deadmau5 wears. For those unknowing as I was, he is a DJ and music producer. This is the head piece he wears when he is DJing, from what I gather. So my search began. What on earth could I use to make something so hard? For reference, a person's face is supposed to be centered in the mouth. Eep! One of my other fellow prop-makers actually came to my rescue with an idea. 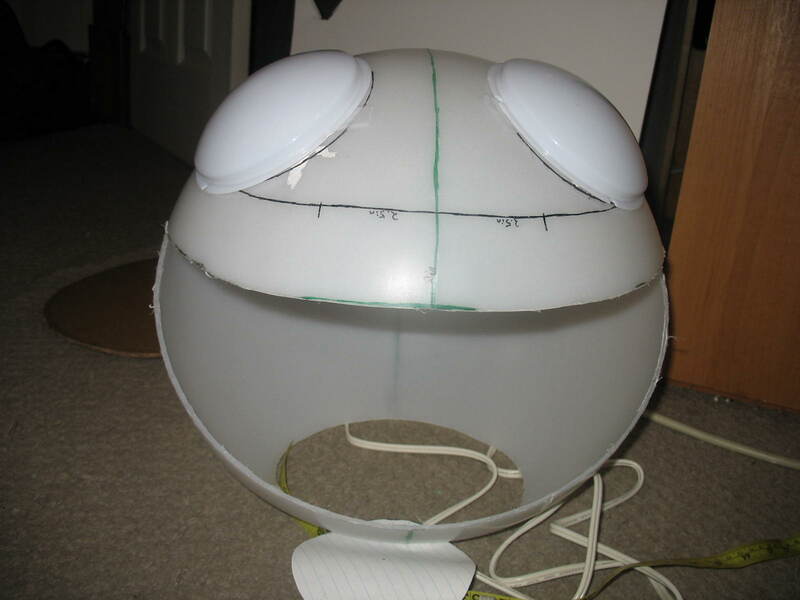 Get ready, it's a funny -- the head is actually the acrylic globe of a street lamp. Yep. 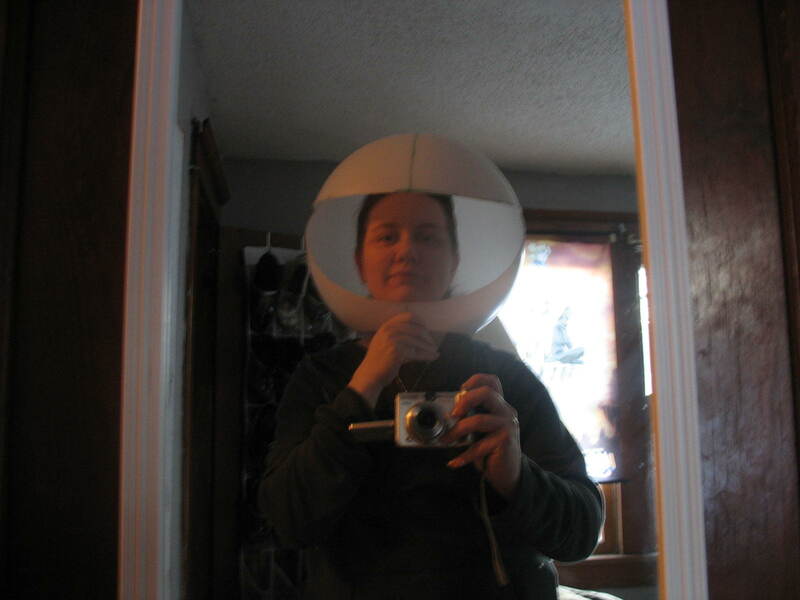 A 14 inch diameter, 5 inch opening lamp globe. So! First things first, the opening was too small to get one's head through. So I began by cutting into the opening to make it 8 inches wide. One fast cut with the dremel later, I had a perfect opening. Here, you can see a few things. 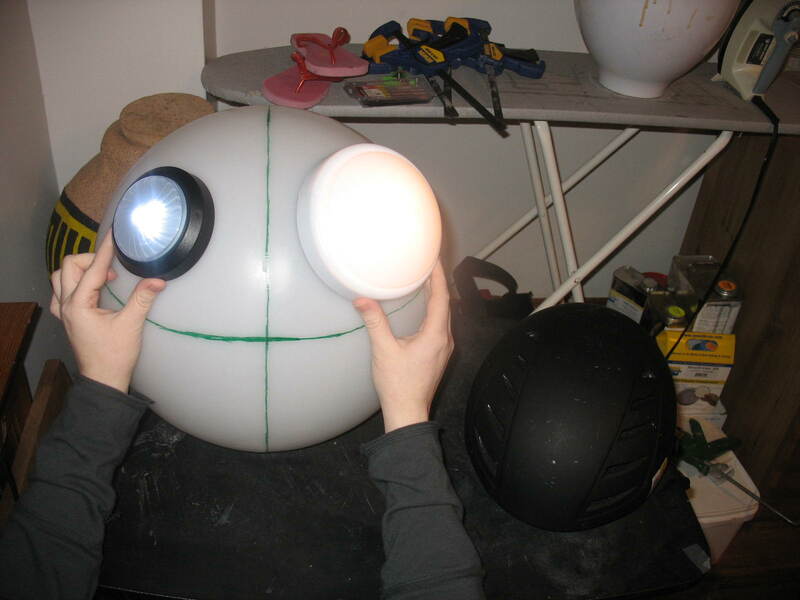 One, I bought two different styles and sizes of lights to go into the head. The client ended up chosing the smaller but brighter light, on the left. With the lights out, it lit up the entire room with just one! In this picture, you can also see the lines I've drawn on the globe. They mark the center going around in all directions, including where the top of the mouth would be. Here's the mouth cut out. It looks so big on the head, but the cut out piece looks smaller. Odd! Hi? This is me with the helmet on. My head and the client's head are almost exactly the same size, so I was showing him where the head sat on me. You can see my face is nicely framed in this really blurry picture I tried to get with no flash. After some quick research, I discovered that the material used in mascot's eyes is called Buckram. It's a very densely weaved material that, as we discovered at the craft store, only hints at the outline of the face behind it and lets me see through. 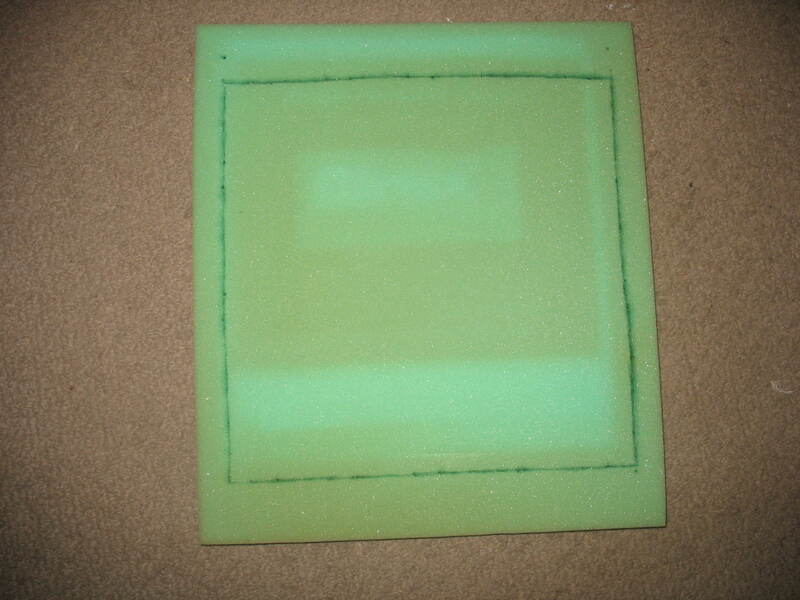 The picture above is the shot in a dim room through the buckram. My client will be DJing with this head on, so I wanted to show what he would be dealing with as far as visibility, and offered that there was a second material of a less dense weave that would show his face more, but offer more visibility. He went with option A, the buckram. This is the helmet I picked up at Walmart. I removed the outer shell and am going to be working with the hard inner shell. Once on my head, the whole big head no longer tipped forward (due to the slant of the human shoulders) and sat with my face perfectly frammed in the mouth without me having to hold it. I'll be soon attaching the helmet to the inside of the head so that the head sits comfortably at all times and doesn't move too much. Last picture for this update - a simple shot of the beginning of one of the ears. 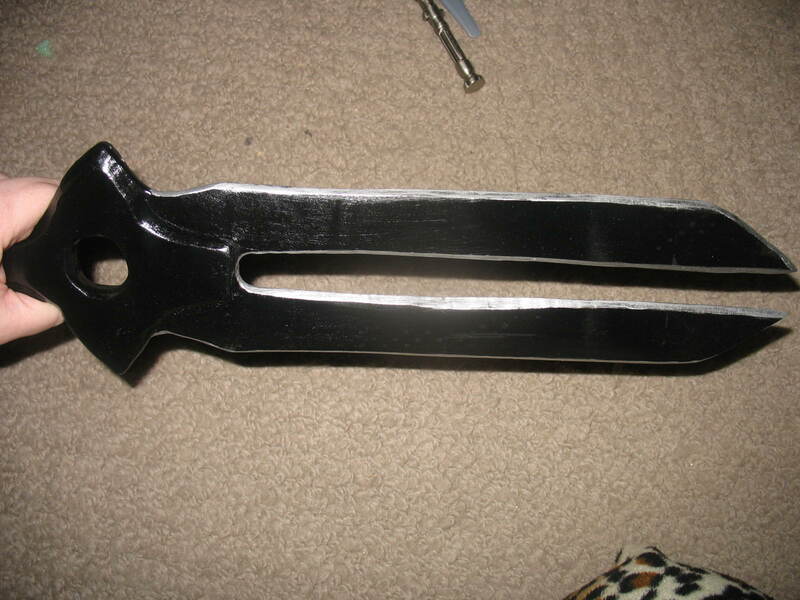 The ears are a somewhat large oval shape, 13 inches wide and 13 inches tall. I'll be cutting these out and attaching them helmet probably on Wednesday. I noted that I'll need to insert something into the ears to make sure they stand upright instead of bending over... I'll need to ponder that over today and tomorrow! 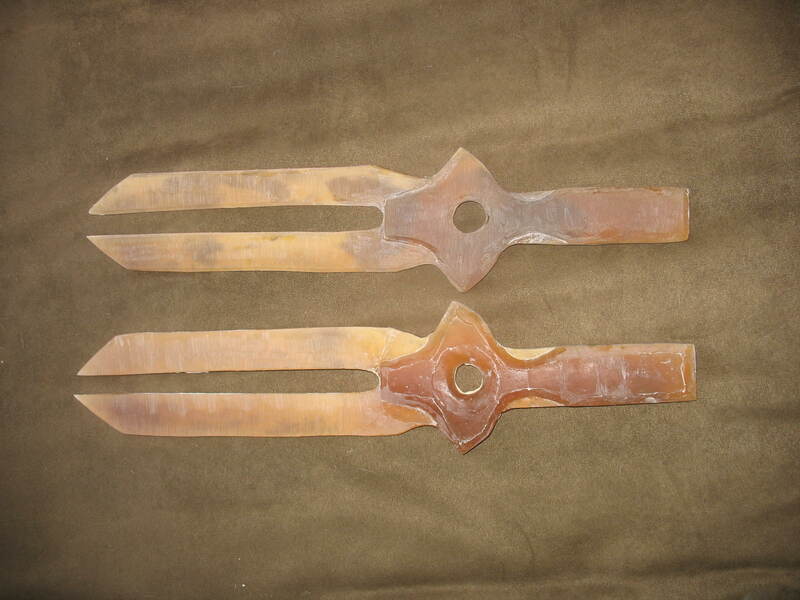 You might wonder how these daggers turned out. Unfortunately, the person who commissioned me never paid their final payment, and thus I ended up sitting around waiting to see how it would resolve before I did my final post on them. 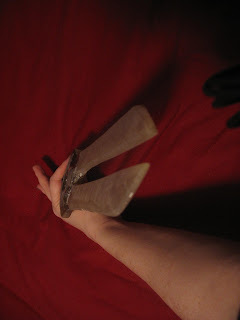 I never did end up getting paid, so these daggers are going up for sale. This is the dagger from the previous mold out of the sander. With my client wanting the blades as thin as they were, I was coming up against a few major problems. Mostly, my cast was not perfect mirror image of itself, and I was having to handle that. 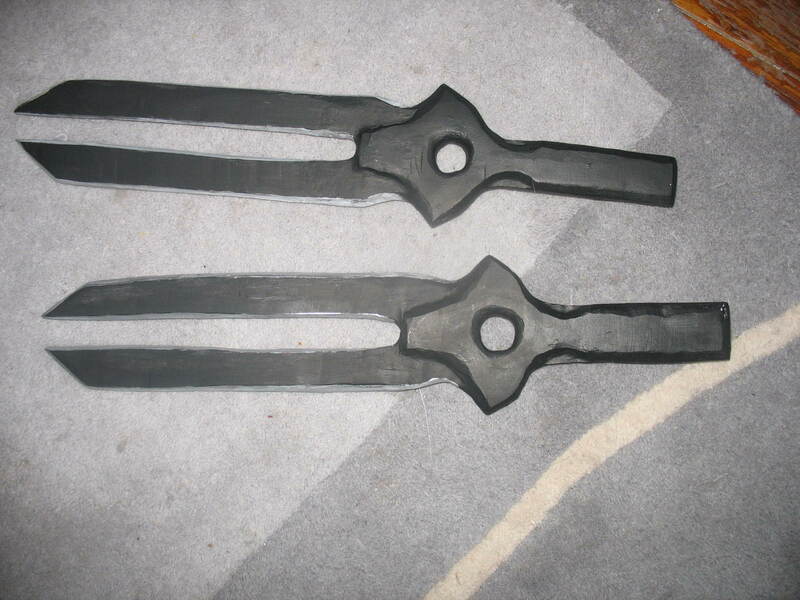 I continued sanding it down, and gave them a fast coat of some boring black matte paint just so I could see the imperfections of the blades. Clearly not perfected yet, but I showed them to the client. He was unhappy with them, so I offered to recast them and give it another shot. 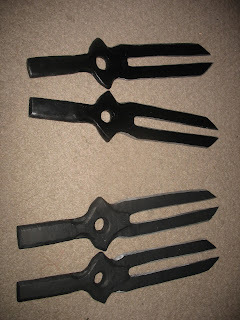 I also wanted to try a different method of putting the blades together, hoping for a smoother make. 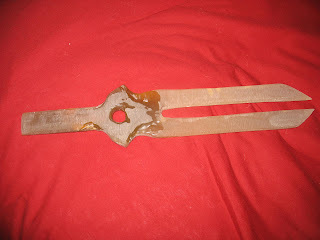 You can see here the top blade is put together using a very strong adhesive, and sanded, while the bottom is the same adhesive, not sanded. So, after more sanding, I was finally happy enough with them to give them their first spray coat. Problem: the spray coat bubbled. Oi, seriously? So, while the daggers looked better, I had to strip off most of the coat and go at it again. The stripped coating and reapply turned out better. I started to edge them in silver. Here are the basic final daggers. They're sitting sullenly waiting for an owner now, due to my commisioner not paying for the final payment. They've been sitting for about four months now, so I plan to touch them up. 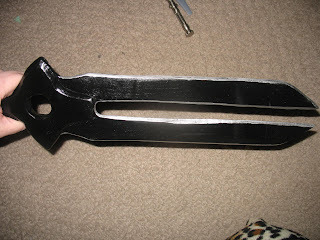 You can see how thin the blades turned out in the end, but I think that was part of what made this all so difficult to do. 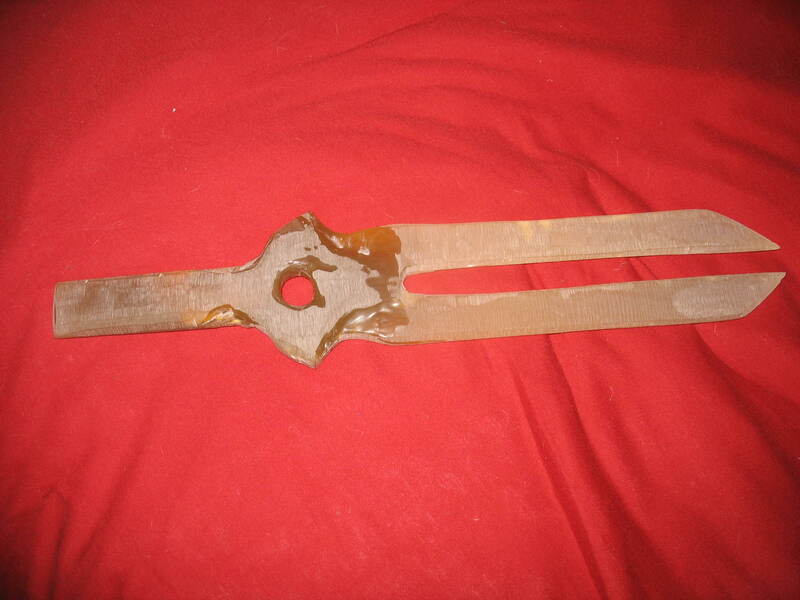 With a thicker blade, a little less accurate, I think it would have been easier to work with. 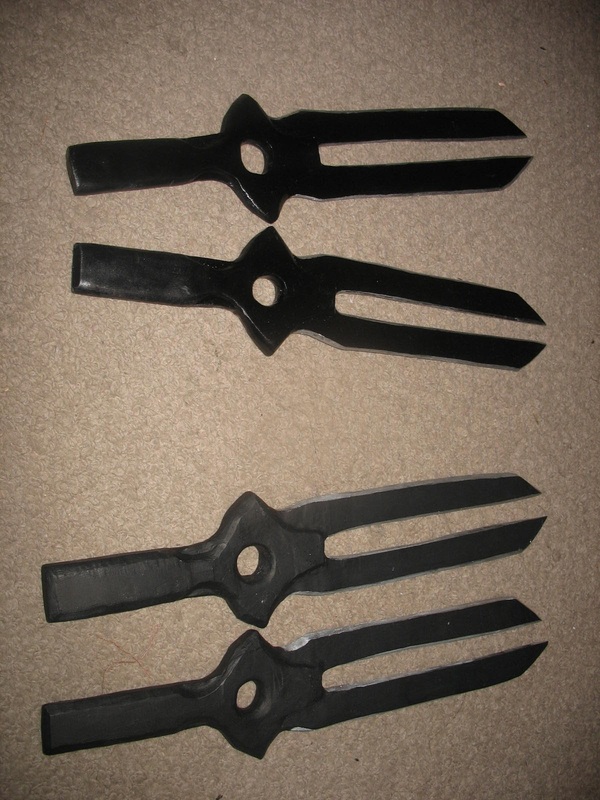 In fact, I actually made FIVE daggers. 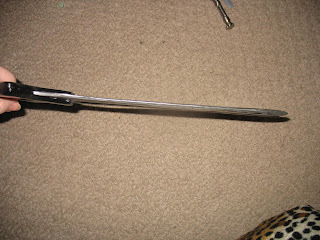 One broke because the blade was so thin. You can see the difference between the final pair (on top) and the first pair (bottom). Final pair has the proper paint and final sanding while the bottom pair does not. As always, I put my thoughts on the pieces. Well, first thought, is I would not do these out of resin if I did them again. I would do them out of wood like I had originally desired to. It was an interesting experience to go down though. 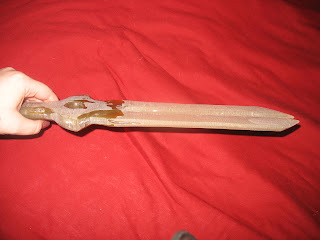 Resin molding definitely has its advantages, but I think in other circumstances than what I tried to do with it. I think the biggest problem was the thinness of the blades the client wanted. It made for quite a few difficulities. I also think I would go at it more with a detail sander than the belt sander. All in all, the daggers look good in photographs, they have an excellent weight, and myself and everyone who's come into contact with them loves posing and playing around with them. If you wish to purchase them, please email me at the email above and we'll come to a price. I'm willing to go fairly good on the price as these aren't made to anyone's specific needs and I'm only trying to get back what was lost due to lack of payment from the client. 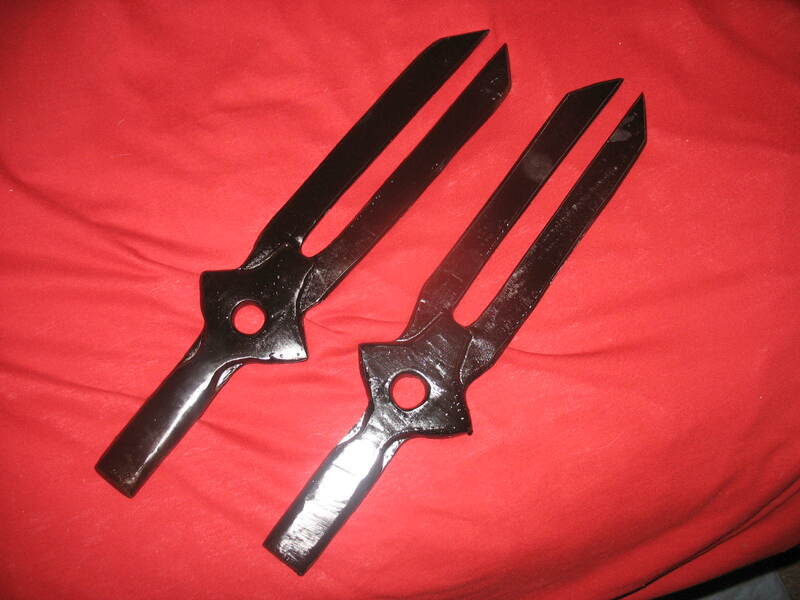 I'd also be willing to sell the first pair, but I would need to finish them off (final sanding and painting). They are a little thicker, a little heavier, and a little more sturdy than the final pair.